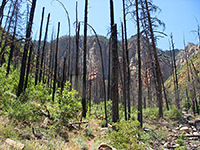 The two main routes south of Flagstaff are interstate 17 to Phoenix and the slower, much more scenic AZ 89A, which passes through thick pine forests for 10 miles before descending suddenly and spectacularly into Oak Creek Canyon, a steep, narrow and very colorful gorge that is at the center of the second most visited area in Arizona, after the Grand Canyon. 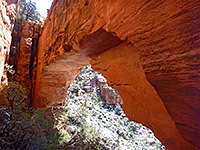 The town of Sedona is situated at the southern end of the canyon where the cliffs open out, and provides a base for exploring the surrounding lands, which include many other canyons and an extensive, scenic red-rock wilderness in all directions. Sedona was established in 1902 but did not become a popular destination until the 1960s, since when it has become a well known center for various kinds of artistry, and a magnet for wealthy retirees, for followers of new age religions and for people just wanting to escape the pressures of city life. 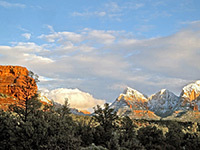 The town has a pretty location surrounded by large red and white sandstone cliffs and buttes, with contrasting greenery provided by a mixture of trees, bushes and cacti. A small steepish zone with no building development separates the town into two parts; the downtown area is centered around the AZ 89A - AZ 179 road junction, where most of the art galleries, restaurants and tourist facilities are found. 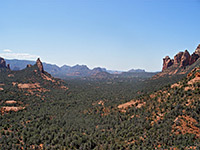 The larger second section (West Sedona) is two miles to the southwest, along Highway 89A, and contains the main residential area, with more conventional shops and amenities. 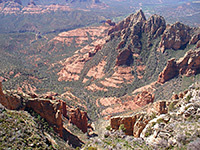 See the map of Sedona for other points of interest in the vicinity. The popularity of this area has led to rather expensive prices, and much development, sometimes at cost to the surrounding landscape, but for many people it is not the town but the scenery that provides the main reason for a visit. There are upwards of 100 maintained backcountry trails, mostly quite easy, and endless opportunities for exploring, camping, fishing, horse riding and mountain biking. The trails index describes all the main paths, while featured routes are detailed below. 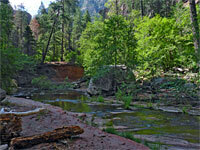 Located in the east section of Sedona, where most of the gift shops, art galleries and other tourist facilities are found, the 65 room Best Western Plus Arroyo Roble Hotel at 400 N Highway 89A has excellent views over the red and white cliffs that surround the town, at the mouth of Oak Creek Canyon. This is an upmarket establishment - one of the top rated hotels in Sedona, and features private balconies and patios, a large outdoor pool, a steam room & spa, landscaped gardens with fountains, and complimentary breakfast. 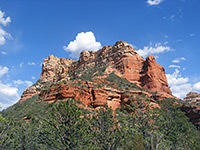 Although located 7.5 miles south of Sedona along Hwy 179 in the village of Oak Creek, the Hilton Resort enjoys the same red rock scenery - north-facing rooms & suites look out towards Bell Rock, Courthouse Butte and many other tall sandstone peaks, while those on the south side have views of the 18-hole golf course. The many other facilities at this luxurious hotel include a full service Spa, two dining outlets, a tennis court, three swimming pools, a well equipped fitness center and 20,000 sq ft of meeting/event space. There are plenty of other restaurants, and small shops, within a few minutes walk in the nearby village.